What can I do if the wireless network is unstable via my wireless router/modem router? 1. Please be sure that when the computer is connected to your internet modem, the internet works fine without dropping. If the internet is not stable, please contact your internet service provider to do some troubleshooting. If it’s a modem/router, please contact your ISP make sure internet line is good. 2. Please check that whether the internet is stable or not when the computer is connected to the router with a cable. If not, please try to change the Ethernet cable, LAN port and computer to carry out a test. Also, you can go to the Download Center to upgrade the firmware of your router if it is not the latest one. Wireless devices intermittently disconnect from the wireless network, while wired devices are still connected and working ok. And the firmware of the router is already upgraded to the latest one. In most cases, this problem is caused by local environmental factors that affect the wireless signal. 1. Locate wireless clients in a reasonable distance. The farther distance away from the router, the weaker wireless signal will be. Try moving closer to the router to see if the connection improves. 2. Get away from obstacles. Keep the router in the most central spot in the home and away from anything that might block its signal such as metal objects, bodies of water, reinforced concrete walls, foil-insulated walls, and other similar construction materials may severely weaken a wireless signal passing through it. 3. Reduce the number of wireless clients. The more devices are sharing the wireless network, the less bandwidth is available for each device to use. One or two devices may be 'hogging' bandwidth. Try disconnecting some of the devices to improve performance on other devices. You may carry out the test by adding one device at a time to the wireless network to check for the maximum number of devices you can use before bandwidth becomes compromised. 4. Decline interference from other wireless equipment. All wireless devices are trying to send data over the air. Cordless phones, baby monitors, Bluetooth devices (i.e. wireless speakers, mouse) and neighboring wireless networks are all competing with your wireless network. Move Wi-Fi devices away from other transmitting devices, or turn them off when they are not in use. 5. Optimize the router’s position. For routers with antennas mounted on the outside of the casing, try adjusting the orientation of the antennas for maximum performance. We recommend placing it up high and also placing its antennas at 45 degrees (diagonally) or 0 degrees (straight out parallel to the floor), which will be more effective. Since antennas always transmit weakly at the base, do not place your wireless client device at the bottom of TP-LINK wireless device. 6. Change some settings on the router. 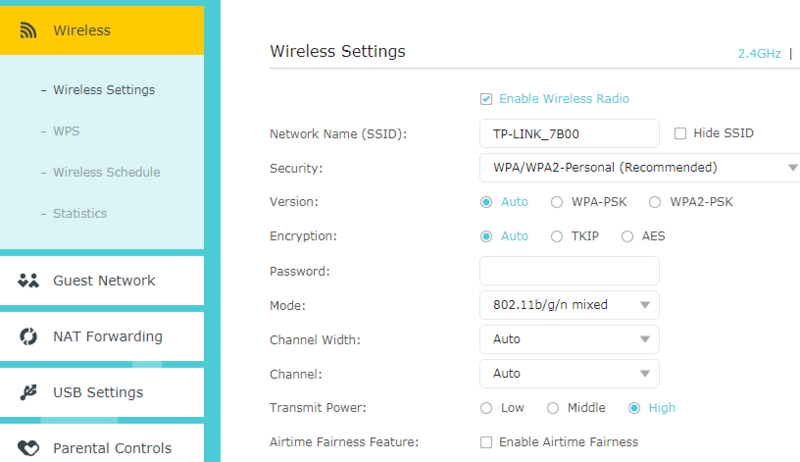 If the issue still persists then you could try changing some wireless settings on the router. You will have to log into the router’s management page. One thing to try is to change to a different wireless channel. Under the wireless settings it is also important to check the Country/Region. If it is set to a different location from you, then you may come across similar issues with the wireless disconnection. Below is an example for wireless router. Please click on Wireless Settings below the setup menu. Change the Channel (channels 1, 6 and 11 are generally best, but any channel can be used). Also, change the channel width to 20MHz which will provide you a more stable and less crowded wireless environment. Click Save, reboot the router, and test for improvement in performance. Please also be sure that you’ve enabled a strong password protection for the router wireless to avoid others connecting to your wireless. 7. Test the WIFI device. If all other devices are getting continuous wireless connection, but some individual device is suffering from an intermittent wireless network, it may due to the device itself that can’t function well. Please try to use the device on another network, or another location to check the performance of the device. Or just try to update the system or wireless adapter’s driver to latest one to see how it goes.